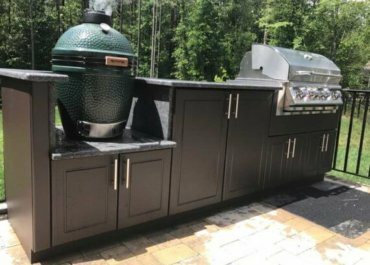 New appliances, like an outdoor pizza oven, are a great way to add variety to your outdoor kitchen. When we think of the family backyard barbeque, the first image that comes to mind is probably a boring kettle grill. We can all remember images of our fathers igniting a pile of charcoal briquettes in a glorious pyrotechnic display, commanding the kids to stay inside for safety. And then, burning burgers and dogs… yawn. Been there, done that. Well that picture is changing. Imagine inviting friends over for pizza night, and then watching their excitement when they find out you’re not ordering delivery, and you’re reheating a frozen pizza. Instead, you’re cooking pizza in your own outdoor kitchen. Adding a pizza oven to your outdoor kitchen doesn’t require a construction project either. 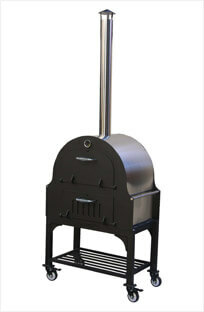 Several options are available for adding a pizza oven to your outdoor kitchen, including award winning cart mounted models from companies like Quintessential Outdoor Living Company (www.indoors2out.com). An outdoor pizza oven on a cart makes a simple add-on to your outdoor kitchen that your guests are sure to love. 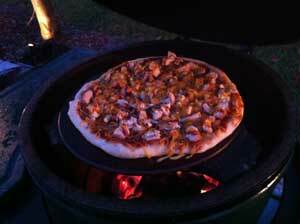 Even kamado style cookers like the Big Green Egg make a wonderful pizza oven. With a plate setter and pizza stone, you’re on your way to cooking gourmet pizza in your own outdoor kitchen.